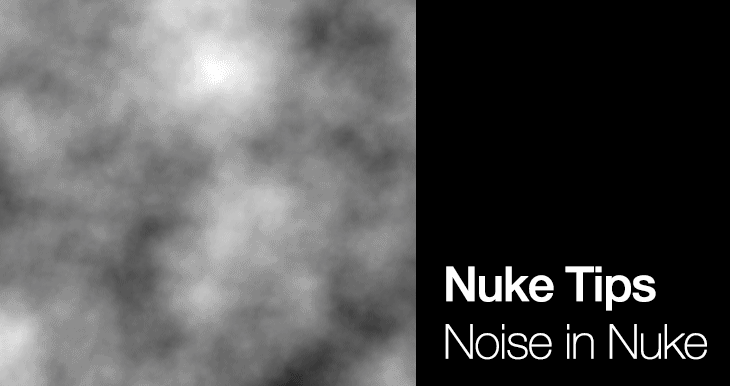 If you ever need to generate procedural noise, the Noise node in Nuke can assist you in creating noise for use in your project. I’ll be covering the basics of the Noise in Nuke and the typical use in my workflow. In case you accidentally end up here instead of the Denoise tips, click here to go to Nuke Tips – Denoise Footage. By default, Nuke will default to fBm (fractional Brownian motion) noise type with the turbulence as the other option. x/y size: Adjust the size of the noise. You can toggle it to adjust both the X and Y separately. z: This control the animation/evolution of the noise. You want to use expression to drive the animation or you can keyframe it manually. octaves: The tooltip mentioned that it controls the amount of Perlin noise function to add. For me, it is a way to adjust the scale of the lacunarity. Be warned that when lacunarity is set to 0, the octaves value will have zero visible result. lacunarity: Adjust the size of the smaller noise pattern. Bigger value results in higher tiling. gain: Controls the overall gain of the noise. You can still further tweak it through a Grade node if desired. gamma: Controls the overall gamma of the noise. Again, same thing can be done using the Grade node. 1) You want to add a simple expression to the Z parameter. Something like “frame/2” (without the quotation marks) should suffice for a quick test. 2) To break up smooth area/edges for more natural blending. Useful if you have high frequency textures that you need to touch up and here’s a great example by Richard Frazer on the use of Fractal blur which uses procedural noise to break the matte edges. 3) As the initial base like creating a smoky pattern with roto, distorting images using the iDistort node or grayscale map for Nuke particle emitters.